I’ve chosen CreateSpace for paperback edition. Ben Galley has a good write-up of all the Print-On-Demand solutions available in UK, but to me it was a toss-up between Lightning Source and CreateSpace, as these were the two that did not require huge up-front payments. In the end, CreateSpace won because of its close affiliation with Amazon. As a beginner, I want as little fuss as possible, and CS’s automatic Amazon listing and support was just what I needed. The process starts with setting up the CreateSpace account, address, payment details, the usual. You will need either account details for money transfers or home address for the cheques. If there will be any. Add new title. CreateSpace allows you to publish Audio and Video files, but for now we’re only interested in paperbacks. The setup page seems straightforward but beware: don’t put anything in the ‘prefix’ box unless you want to forever be known to Amazon as ‘Mr John Smith’ instead of plain ‘John Smith’. It took me several e-mail to customer support to get rid of the silly prefix. The rest of the form is self-explanatory. Let’s move on. ISBN. That’s an important choice. I had my own ISBN and joyfully entered that – but beware! Entering your own ISBN will prevent CreateSpace from sending your book to US libraries. If this is something you care about, select Free CreateSpace-Assigned ISBN instead. This step cannot be reversed! For my book I chose the next closest size, 5”x8”. This is the size that, for example, Game of Thrones paperbacks are printed in, or the ‘adult’ editions of Harry Potter. Make sure to select black&white interior, unless you want to pay for the nose. I chose white paper instead of cream – the consensus seems to be it’s better for fiction, and there is no price difference. You can upload your interior if you have it ready, but it’s not really a good idea. Instead, download the formatted template from the website and start working on your book in Word or equivalent software. This will give you a good idea of how your book will actually look like and allow you to fine-tune it to very minor details. And this is where this post ends. Tune in next time for the woeful tale of formatting a paperback manuscript. 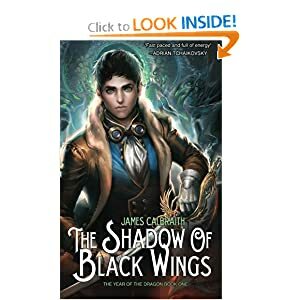 Posted on July 25, 2012 September 12, 2012 by James CalbraithPosted in Books, Publishing, WritingTagged amazon, createspace, formatting, paperback, post, publishing, self-publishing, shadow of black wings, trade paperback.